Gas-masks were issued at the beginning of WWII but some six months later we were told that Hitler was using a new form of gas which the original gas masks were not suitable to deal with. Consequently we had to return to the gas mask depot and a small extra filter was taped to the end of the gas mask, hence the pictures of the later gas masks which were slightly longer had light coloured tape on the filter showing where it was fitted. The recent "Upstairs Downstairs" drama has it wrong when it shows these longer gas masks being issued right at the start of WWII. The mask in question is the heavy duty (ARP and others) and was probably used by a switchboard operator. I have one exactly the same which was part of a batch sold off as military surplus in the late 1970s. 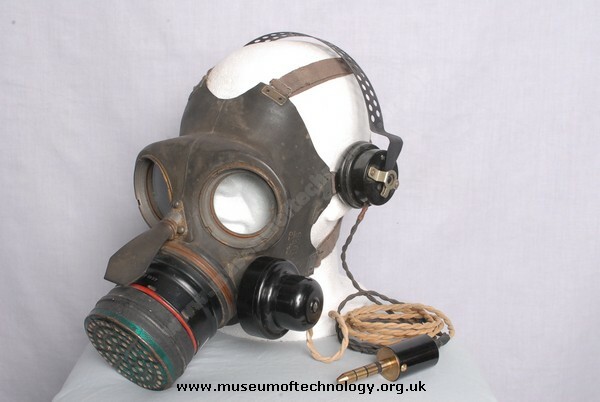 There were three "standard" respirators during WW2, the "civilian" one of thin rubber and no exhaust valve - air blew out under the rubber over the cheeks, the "Duty" respirator for essential personnel who needed to work while wearing the mask, and the "Service" one with separate canister for the armed forces and civil rescue teams needing to do heavy work while wearing gas protection.